Enjoying The Course: 2013 Goals - How'd I Do? Are you sick of my recap posts? This is my last one for 2013. Promise. You probably already know from this post that I had a pretty great year, but in relation to my 2013 goals, it was a bit of a failure of a year. About halfway through the year, I ditched this goal in favor of running my 3rd marathon. At the start of marathon training, I'd hoped to continue working on speed as well, but that simply wasn't in the cards. I may have eaten a bit healthier, but I didn't try two new recipes a month. Sticking with what I know is so much easier! My workouts were OK throughout the year, and I tried to focus on my arms and upper body, but there is no measurable difference today. I read a grand total of 3 books this year. In January. Oops! Serve more, including CharityMiles and community service with my husband --> So sad! I wasn't even consistent with using CharityMiles! 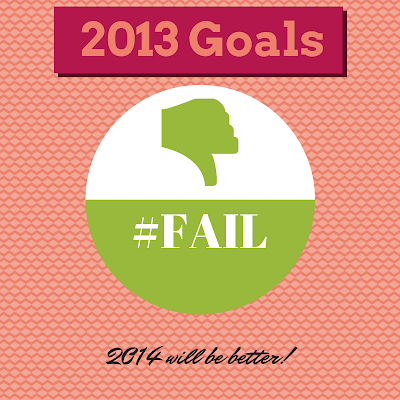 Even though I didn't accomplish stick with my goals for 2013, it's only a complete failure if I don't learn something, right? So, now I can will hopefully make better goals for 2014! Sorry for the downer post. I probably shouldn't have kept this one for last. LOL. For cheerier end of the year posts, be sure to read about my #yearofrunning13, my Top 13 of 2013 posts, and, of course, my 2013 Year in Review. Have a safe and happy New Year's Eve tonight!! See you in 2014!! It's so true! I loved this year - even if my goals changed or were forgotten.